A poultice for infection is one of those tried and true remedies that most people have heard about. If you'd like to try a poultice for infection, here's how to create one, what to use, and when to use it. A poultice consists of a hot pack held against the site of an infection. Traditionally, crushed herbs have been used and held with another plant or a bandage over an infection site. The combination of moist heat from the poultice and the herbs usually draws out the infected material, allowing the infection site to drain. Heat can kill some bacteria, but the goal of the poultice is to allow the infection site to drain off and expel whatever is inside the wound that can be causing pain, inflammation and infection. Making a poultice is fairy straightforward. After mixing the appropriate herbal ingredients, you can pour the mixture onto a cotton ball and hold the moist cotton ball against the infected area. If using fresh herbs, crush up the herbs and press them against the infected area. 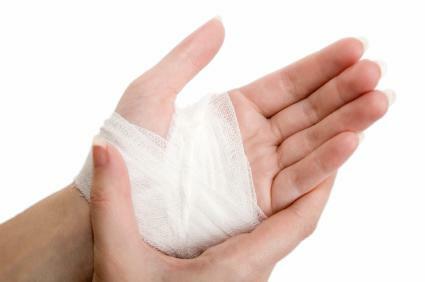 A bandage can be used to secure the herbs or cotton ball in place. Poultices should be changed frequently, particularly a poultice for infection, to keep the wound clean. Many recipes for traditional poultices exist. A skin poultice for infection contains calendula and lavender oils. This is also a great poultice for sores that won't heal. To make this poultice, you'll need the following essential oils, plus fresh comfrey and calendula flowers, a clean mason jar, and sterile water. Take ¼ cup of crushed comfrey leaves, ¼ cup of calendula flowers, 1 drop of lavender oil and add it to a mason jar filled with sterile water. Cover, shake it up, and leave it for four days in a dark, cool area. Strain off the leaves and flower petals and retain the liquid. Place the liquid in a glass container. Wet a cotton ball with the liquid, press it against the wound or bandage it against the wound. Poultices work well for boils and carbuncles, and you can make a simple boil poultice at home with just tea tree oil, hot water, and lavender essential oil. Place a few drops of tea tree oil and lavender oil into about two cups of hot water. The water should feel hot to the touch but not be so hot you have to pull your hand away fast - it has to be very warm, but not hot enough to burn you. Be careful not to overheat the water and burn yourself! Mix the oils into the water and saturate a rag or cotton pad with it. Press it against the boil. Repeat and keep the poultice on for fifteen minutes, then take it off for 15 minutes. The boil should come to a head quickly and the tea tree oil and lavender will kill any of the staph bacteria on the skin or coming out of the boil. Comfrey is a powerful wound healing herb. It's been used since ancient times to heal broken bones and skin wounds. Use comfrey externally only. If you can find fresh comfrey leaves, they make a great poultice. Simply crush up the comfrey leaves and press them to the wound. Alternately, a comfrey and calendula poultice can be made by placing fresh comfrey leaves and calendula flowers or essential oil into a blender with a bit of water and mash it up. Place the mixture in cheese cloth, wrap it to form a small package, and press the cheesecloth wrapped comfrey package against the wound. Hold it in place for about half an hour, then remove. Refresh and repeat the comfrey poultice four times a day. Be sure to use some type of permeable cloth to keep the mashed leaves from entering the wound. While smashing up comfrey leaves with your fingers leaves them big enough to pull away, when they're blended together they can be too small to see and some can get into the wound. Granny's Attic for many different types of poultices. Home Remedies for You with additional poultice advice and remedies. Play it safe…see a doctor if you have any concerns about an infection.